Can you spot the Arch? I'm always looking for ways in which to engage kids with various learning modalities in my school-age programs. We all know the kids who are all over the Lego Club but would never attend a Valentine craft program; and, on the flip side, there are the kids who get excited about anything involving paint, glitter, and/or feathers but who shy away from anything with "science" in the description. 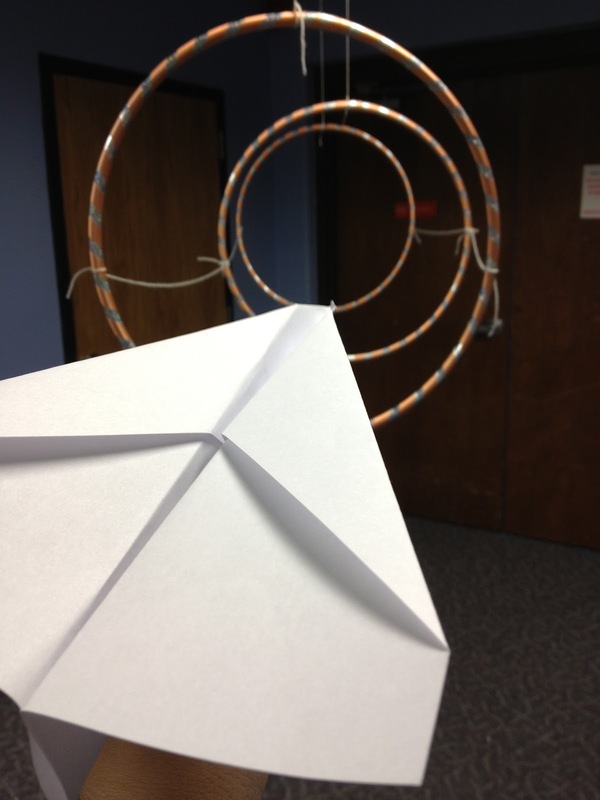 I like to brainstorm ways to engage all types of kids with all types of interests all at once, to incorporate elements of crafty with engineering/problem-solving. I think I found a way. Shoe Box Cities was a program I offered for the school-age crowd on an evening during our local spring break. The premise: come to the library to think about what goes into planning a city or town, then make one to take home. I also set out Smarties. Supplies were simple and free: staff members donated the lids of old shoe boxes, and I was given the go-ahead by our local hardware store to nab stacks of paint samples. 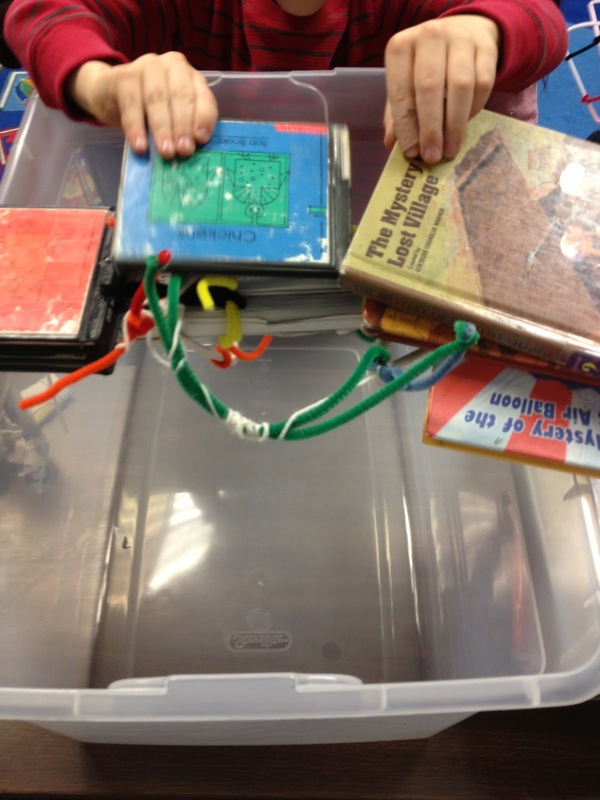 The only additional building tools were scissors, tape, and markers. I opened the program by asking the children what they like about the place they live--in our neck of the woods, that can include St. Louis. From there, we made a list of all the things we would include in a city if we were in charge of planning it. They covered transportation, sporting arenas, stores, restaurants, the library... I was very impressed at the depth of thought these kids gave to what they would want in a city. Then, for the majority of the program, we built. We had a smaller group--14 people total--and we were all seated in a large square. 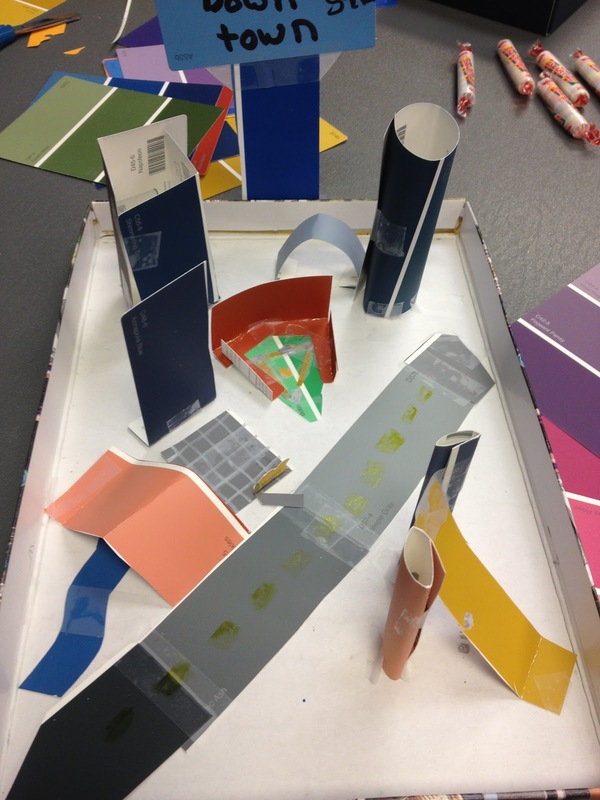 I joined in the building, but every five minutes or so I would circulate to see the cities-in-progress, asking questions and requisitioning specific colors of paint samples as needed. I loved seeing how willing the kids were to help one another, too; when one figured out a way to make a miniature baseball field, he shared the knowledge with other eager sports fans. We also spent our work time talking about the books we'd been reading; I always love these informal book conversations as a means of quietly championing the joys of reading. By the time the program ended, we had a myriad of interesting, intricate cities. Several children made their dream cities; one made a replica of the street with her school and the nearby grocery store; and one decided to think outside the box and make a shoe box house, complete with bathroom and attached garage. What I think works about programs like this: there are no limits, but there is structure. 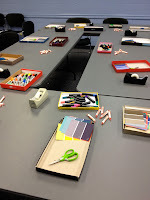 The open-ended, creative possibility appeals to the artsy crafters, and the "how would you accomplish this task?" aspect appeals to the kids who identify themselves as builders and science folks. Everyone enjoys the program content, and, best of all, everyone leaves with a feeling of personal accomplishment. That's a big success, if you ask me. 1. 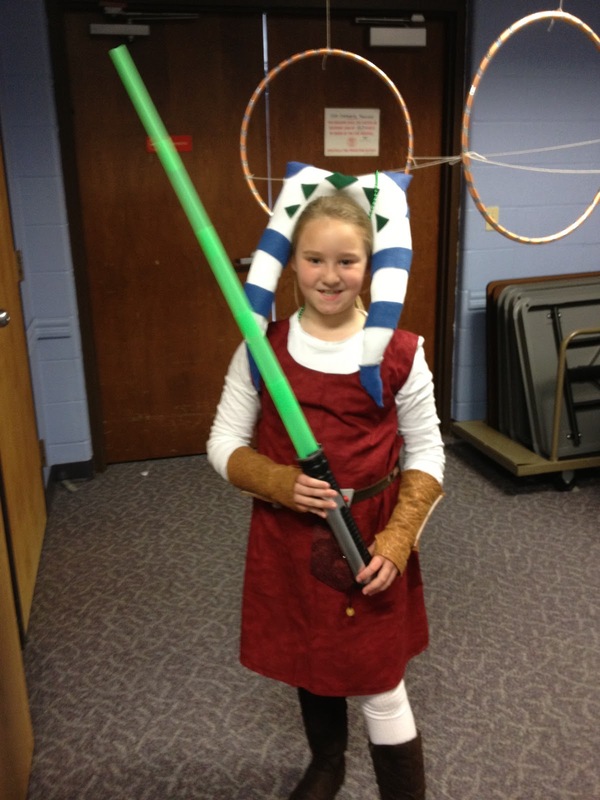 Costume Crafts -- Kids were encouraged to show up in costume, but I wanted everyone to have the opportunity to dress festively regardless of what they have at home. I drew templates for two costume headbands: Leia buns and Yoda ears. I printed the templates onto construction paper, and kids could cut and staple to create the costume they wanted. 2. Droid Toss -- This game was a repeat from last year--so many kids don't know what Bozo Buckets was, so they're intrigued by this "new" game. Kids tossed soft balls (meant for pool play) into a series of small trash cans decorated like droids; their reward for their effort was a piece of candy. 3. Star Destroyer Navigation -- I put up instructions for a simple paper airplane, which does already resemble a Star Destroyer in shape. Once they had constructed their Star Destroyers, kids tried to navigate their ships through warp speed--hula hoops suspended from the ceiling. Lots of fun, plus kids could take home their Star Destroyers. 4. Lightsaber Station -- I expanded on last year's Lightsaber Practice station, wherein young Jedis tried to keep balloons afloat as long as possible using a lightsaber. 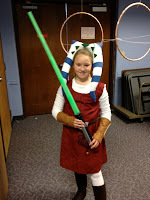 This time they made their own lightsabers, using a cut out hilt template on white cardstock and a piece of rolled-up neon cardstock for the blade. 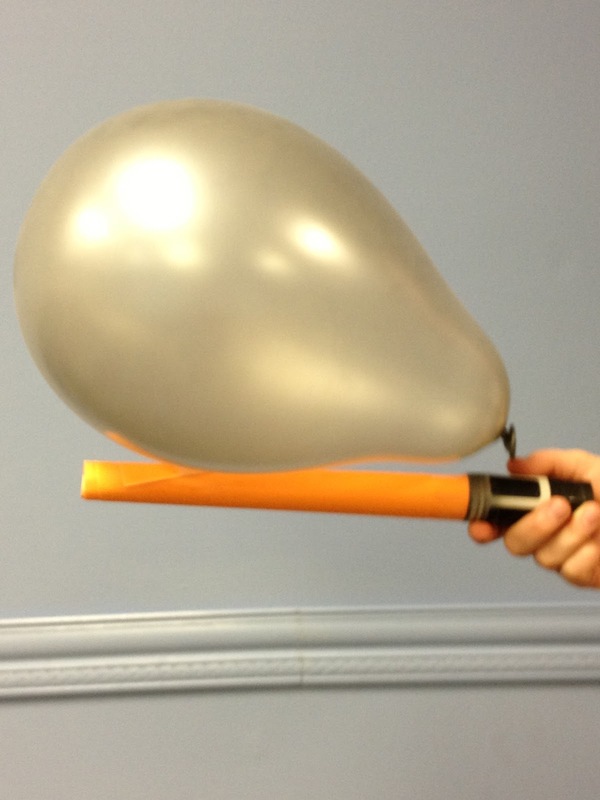 After creating their own lightsabers, which they could take home, kids tried to balance the balloons. 5. Destroy the Death Star! 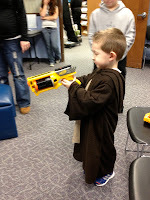 -- It takes precision with a laser gun to shoot down the Death Star, as we all learned in Episode IV. 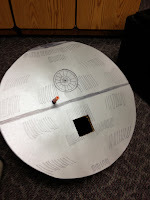 I made a posterboard Death Star, affixed it to a cardboard box, and cut a 4"x4" hole in the setup; kids then stood behind a masking tape line with a "laser blaster" (Nerf gun) and attempted to make the Death Star-destroying shot. The reward, aside from blowing-up noises from me, was a piece of candy. 6. Jedi Library -- I put out Star Wars books we had on the premises as well as several copies of everything from the Origami Yoda universe. The Jedi Library also boasted instructions for folding Origami Yoda, a template for making a Fortune Wookiee, a life-size cut-out of Darth Vader, and some great Star Wars READ posters from ALA. Lots of books checked out. 7. Jedi Archives Trivia -- I recycled the trivia questions a volunteer made for us last year. This time our trivia station was located at the reference desk--an attempt to keep people circulating throughout the library during the event. The very accommodating adult reference staff asked the young Jedi questions (easy, medium, or hard), for which they were rewarded with their choice of Star Wars sticker. Three of the 501st posed with kids in their Yoda ears. We made a few substantial modifications to the program itinerary this time around. First, we spread the program over 3 hours instead of scrunching it all into one; we advertised the program as come-anytime-during-the-event in the hopes that our large number of attendees would be spread out (as opposed to the 170 people in our relatively small room in one hour last year). This switch was definitely successful--we had a bunch of people in the first hour, then a slower period in the middle, followed by a second influx of families in the after-work 5-6 p.m. hour. Second, to provide kids more bang for their buck, we added more multi-step craft components--to engage kids longer and more meaningfully. 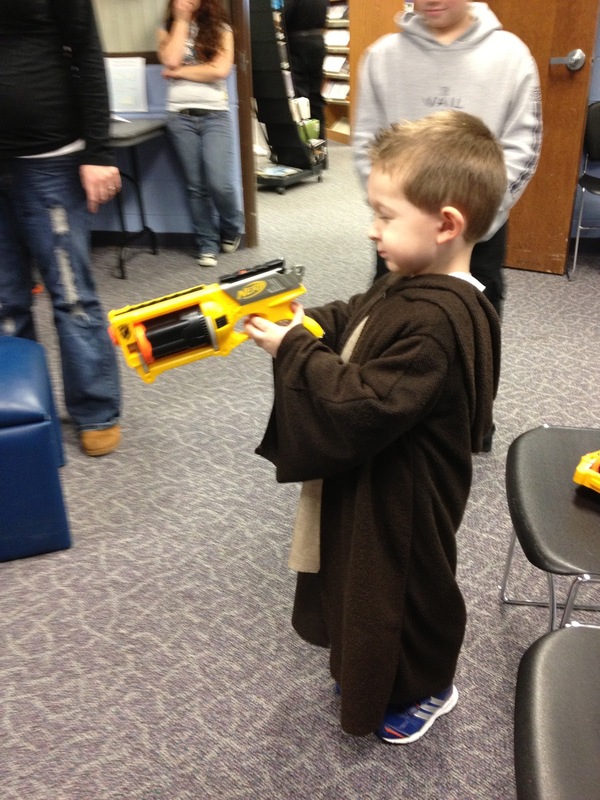 We still offered a number of carnival-style games, but the juxtaposition with longer hands-on activities expanded everyone's Star Wars Day experience while providing them with cool take-homes. I highly encourage any and all libraries to offer some sort of Star Wars-themed event/craft station/etc. 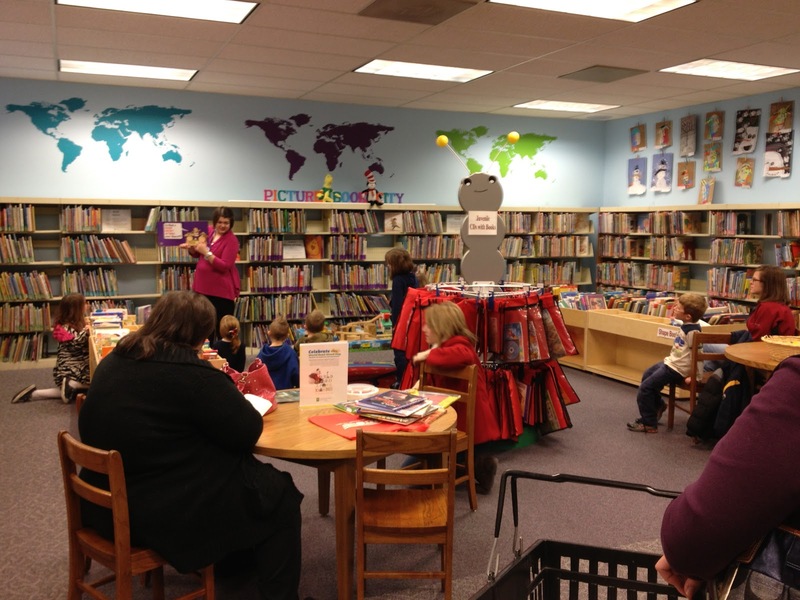 The kids love it, the parents and caregivers get really into it, and there are plenty of opportunities to be part of a larger library celebration throughout the year. There's May the 4th Be With You coming up, then Star Wars Reads Day in October. Make plans--these are the library programs you've been looking for. One of my favorite things about going to conferences is the opportunity to have lots of conversations with my colleagues about topics that are relevant to librarianship as I know it. That's one reason why I am glad that ALA Annual offers Conversation Starters and Ignite Sessions--less formal sessions than the conference programs, but still great content that packs a punch. Better yet, regular ALA members like you and me get to have a say in which of these sessions that will take place at the conference. Through March 31, ALA members can view the Conversation Starters and Ignite Session proposals, then vote for the ones they'd most like to see take place in Chicago this summer. I've voted for the sessions that speak to me, and I hope you'll consider doing the same. I also hope you'll consider voting for the two Conversation Starters I'm a part of. I'll share the details below, and if the topic sounds interesting to you, I sure hope you'll give our sessions the thumbs up. 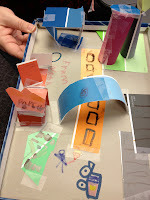 Description: STEM for preschoolers! Dance parties for toddlers! When we stretch beyond storytime, our youngest patrons benefit from richer learning experiences, their parents and caregivers engage with the library in fresh ways, and staff become motivated by new, creative challenges. Jump out of the storytime box and explore active and passive early-childhood programs that are easy to plan and repeat, maximize your staff resources, and enable you to reach more young families. Our panel will share program ideas, planning resources, and early literacy connections to help you leave prepared to build on the core storytime experience. *Check out our Preschool Plus Programming board on Pinterest! Description: Do you find yourself spending tons of time planning school-age programs that are over in the blink of an eye? Are you ready to challenge yourself to be more efficient with your staff time and department's resources? Discover how to streamline planning and preparation while offering worthwhile literacy-centered programs--where kids help shape the direction of the program! Panelists will share tips for "unprogramming" at your library as well as ideas for helping staff adapt to this new style. Prepare to leave with a myriad of program ideas and resources for unprogramming on your own. *Check out our Unprogramming at the Library board on Pinterest! 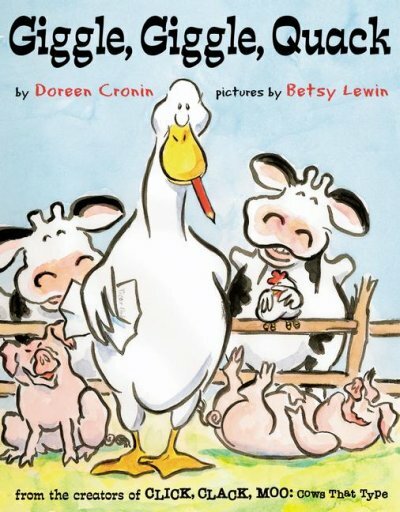 This story, about a farmer who goes on vacation and leaves his brother in charge of some mischievous animals, affords great opportunities for paying close attention to the pictures. I ask the children to pay attention to Duck--he's trouble!--and the object that he picks up. By the end of the story, the whole room feels in on the secret that Duck has been playing jokes on the farmer and his brother. Fingerplay: "Five Little Monkeys Jumping on the Bed"
I encourage the kiddos to use their five "monkeys" to help me with this rhyme while I use my finger puppets. Throughout each chorus, children make their fingers jump up and down on the bed; they get really into saying the rhyme. What a great way to work on fine motor skills with finger movement while also engaging in rhyming, counting, and cause and effect. 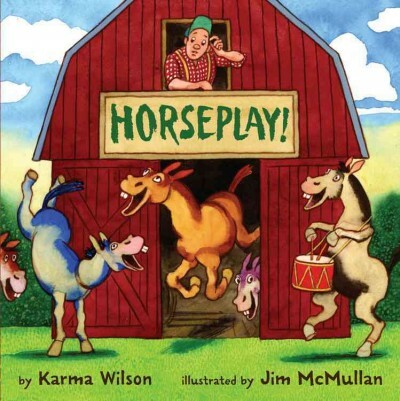 Does anyone rhyme quite as well as Karma Wilson these days? 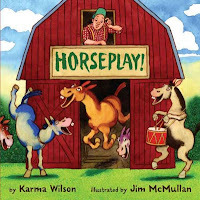 My children always seem captivated by the lyrical nature of the text, and this amusing story of some horses intent on playing all the time was no exception. The fanciful pictures are a hoot, too. Rhyme: "I Went to the Zoo Today"
I went to the zoo today! We repeated this rhyme multiple times, inserting a new zoo animal each time. My favorite unexpected moment was when a child suggested "zebra"--the whole room immediately making a buzzing "Z" sound. Not quite the sound a zebra makes, but definitely a sound we make when we say "zebra!" 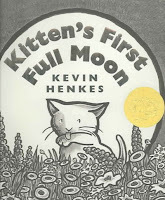 Kitten doesn't really misbehave in this story, although she does get into some messy situations while in pursuit of the full moon, which she mistakes to be a bowl of milk. 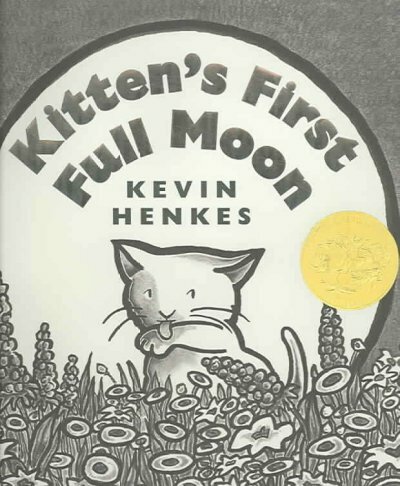 This Caldecott winner boasts a lovely, quiet story along with the beautiful illustrations, making the book a great closer for a story time. Spring outreach often means visiting preschools where the classrooms span a number of ages. 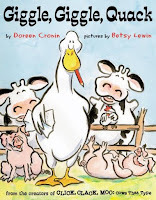 This main "Animals Misbehavin'" story time might not be appropriate for all ages and audience attention spans, so my outreach bag also included a few shorter stories and some additional lyrical elements. I'm lucky in that my staff, who occasionally go out on these outreach visits, feel confident about choosing books and interactives that fit the crowd; I just make sure the Story Time bag has plenty of great options. 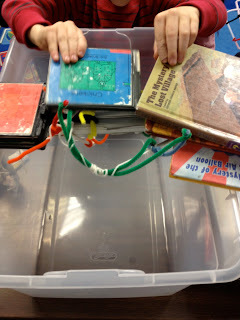 I'm over at the ALSC Blog today talking about Bridge Science, the latest event in my library's school-age science series. Head over there for full details! I feel like I'm always doing something or other to change things up in the children's area of my library, and I consider myself lucky that my branch manager also values keeping things fresh and engaging for kids. We recently had two new features installed. First are the AWE Early Literacy computers. 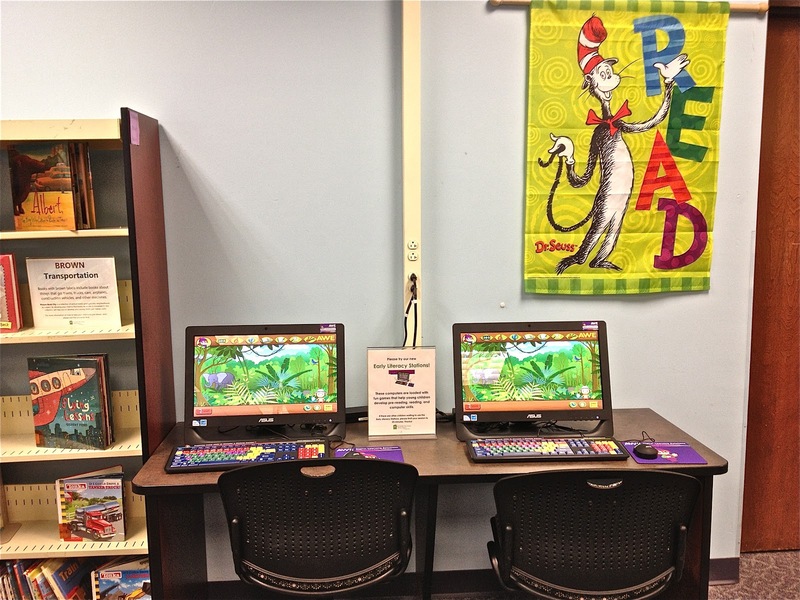 I interned at a library with three of these computer stations, and a few other branches of my current library district had the stations when I was hired. I immediately put Early Literacy Stations on my branch wish list. The machines were budgeted for this fiscal year and installed in Picture Book City last week, and they are already a hit with our young customers and their families. Within five minutes of the computers being set up, a three-year-old was exploring an Elmo game with her father sitting next to her. They were having great conversations about letters, talking about how to click with a mouse, and exploring all the stations have to offer. It's only been a few days since these computers were installed, and already I've seen other great child-caregiver interactions happening at our Early Literacy Stations on multiple occasions. Next are endcap OPACs that are situated in the chilren's area--one inside Picture Book City, and the other on the end of our range of J Bios and award-winners. These OPACs are mounted at a great height for children to use them, and use them they do. I was slightly surprised at the uptick in children doing their own catalog searches before asking for help at the reference desk; it appears having the OPACs in the midst of the library spaces kids already use really does make a difference. 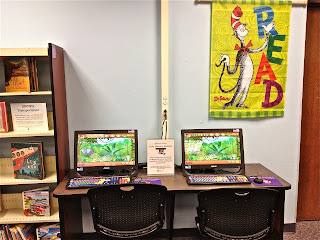 Since these endcap OPACs were installed last week, I have seen more school-age children using them; more caregivers narrating their search processes for their onlooking children; and more caregivers feeling less stressed about doing several searches at a time because they can now access the catalog while still within sight of their children playing in Picture Book City. Talk about making things easier for customers! That's what's new in the children's area of my library these days. What new or interesting things might your customers find in your spaces? 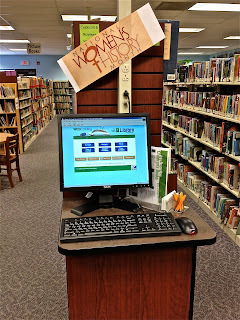 One year ago today, I published my first blog post here on The Show Me Librarian. 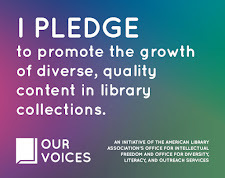 My goal in starting a youth services blog was to share the reading, programming, and library advocacy that are key components of my job as a children's librarian. Now here I am, one year and 168 posts later, and I cannot believe that there are readers with whom I can celebrate this milestone. For real--readership of my previous blogging endeavors consisted almost entirely of my mother (Hi, Mom! Thanks for always supporting me!). I am blown away by the terrific connections I've made and conversations I've had as a result of taking my librarianship presence online. More than that, I feel privileged to be a part of the online YS community. I hope I'll be able to celebrate being a part of that community for many more years to come. 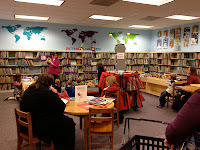 Two things happened recently: Marge at Tiny Tips for Library Fun wrote a fantastic series on school/public library partnerships, and I was asked if my library would staff a table at a local elementary school's Title I night. Perhaps I should clarify. My branch library has longstanding relationships with several of our local schools; we make regular appearances at the beginning of the school year on back-to-school nights, during the winter at literacy events, and before school gets out in May for summer reading rallies. We definitely have an existing partnership with our school district, at least on a basic level. Basically: they ask us to attend an event, and we do. Feeling pretty happy with that least of motivations and intentions, I settled into my "library booth" personality for the evening. The event was 90 minutes long, but I only really saw students and their families for around 40 minutes in the middle of that block of time. During the event, I primarily saw and talked to teachers, the school librarian, and the principal. And yet I had forgotten to include them when considering why I was at the event in the first place. A lightbulb went off in my head during the last half hour of the event. That's when I started engaging teachers and the principal in conversations about what books their students were reading. A fourth-grade teacher mentioned sharing The One and Only Ivan with his class in January, and we got to talking about the Newbery Award and what previous winners he has shared with his students. I chatted with the principal about his goals for reading across the student body. These conversations got the wheels spinning in my head regarding how I might partner with specific teachers, classrooms, and schools. Now I've got plans for how to pursue more meaningful partnerships with interested area schools, from getting kids more involved in the lead-up to summer reading to visiting classrooms to talk about the history of the Newbery Award, which committee members are encouraged to do. I've got ideas about working with principals to create school-wide--perhaps even district-wide--reading initiatives that don't place all of the burden of providing resources on school libraries and school budgets. I am, in short, excited about the prospect of partnering more meaningfully with local schools. Sure, I'll still show up when they request a library presence at a school event. But in the future, I hope our work together will be so much more than that. Sharing stories with children is one of my favorite parts of my job. That's why I loved being able to participate in World Read Aloud Day yesterday. I previewed my WRAD format last month; I called it "guerrilla story time" on Twitter, emphasizing that my goal was to engage children who happened to be in the library on March 6 with an unexpected story time. That's exactly what happened, too. My coworkers and I read 12 books and poetry selections for World Read Aloud Day--one for every hour the library was open. We announced the events over the PA system, and as we walked back to Picture Book City to do the readings, we encouraged any interested kids to come listen for a few minutes. Many kids did, and they all had smiles on their faces. Ah, the simple joys of being treated to a story read aloud. We had over 100 people enjoy our WRAD read alouds, and almost all of the children and grownups opted to add their names to our reading wall afterward. I would call this program a definite success, especially when one considers that we didn't have any formal programs (story time, Lego Club) going on during the day to draw people to the library in the first place. Our participants were people who are happy to set aside what they are doing for a few minutes to enjoy reading. When all is said and done, the names on our reading wall show that we are a community who values literacy. I encouraged everyone to share the books they love with people they love, and they assured me they would read it forward. Did you celebrate World Read Aloud Day? What did you do? How did you read it forward? When I got my job here in Missouri back in the summer of 2011, I had just attended the 2011 ALA Annual Conference in New Orleans; I was bubbling over with enthusiasm, especially for early literacy. That energy, my now-boss says, came across in my interview. I was so gung-ho in my interview, in fact, I even used the phrase, "Even if you don't hire me, you have to do this." I was referring to creating an early literacy calendar. 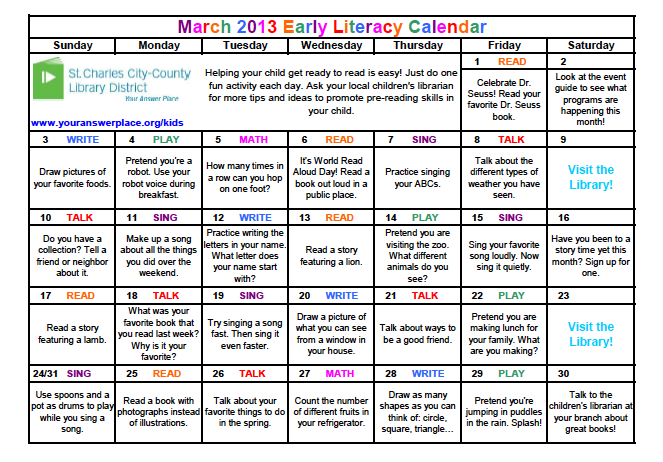 It's now over a year and a half later, and my library district does indeed have an early literacy calendar. Each month, we create and make available a calendar full of simple suggestions for early literacy activities that caregivers and their children can do almost anywhere--non-intimidating activities that build pre-reading skills. The activities are based around the ECRR five practices with some math thrown in. The children's staff across the library district take turns filling in the monthly templates I've created; each branch is tasked with populating a calendar with activities every 9 months. For that relatively small amount of work on the part of our children's staff, the benefit to our communities is significant. 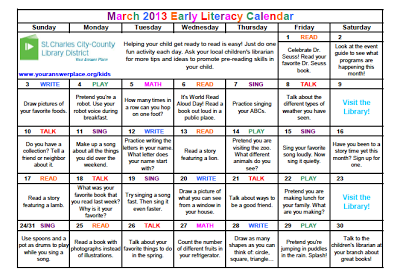 We hand out early literacy calendars at our baby, twos, and preschool programs. We have copies of the calendar available at the check-out desk. We share the calendars with local preschools and day cares, encouraging them to make photocopies for the parents of their charges. We post a link to the current calendar on our website, and I have started sharing the pdf on our Library Foundation's new blog. We pass it out when we register pre-readers for summer reading. When workloads and budgets allow, I want our graphic design guy to rework the look so we can make the calendars available at grocery stores and doctors' offices. If dreams came true, our early literacy calendars would end up in the hands of every caregiver in our county who spends time with a pre-reader. We librarians know how seemingly simple activities can have a great impact--and we often have thousands of potential activities bouncing around our brains, ready to meet the needs of our communities. Now those activities and tips can reach a wider audience. That's why we offer an early literacy calendar. 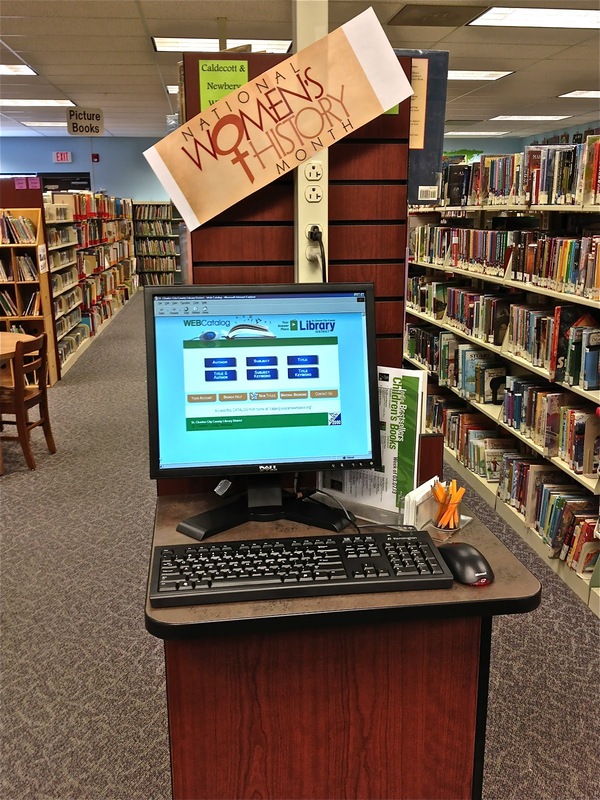 Back in December of 2011, Lisa Taylor of the Ocean County (NJ) Library shared her library's successful Black History Month program on ALSConnect (you'll need to log in to ALSC to view the original write-up). By pairing the story of the invention of the potato chip with a potato chip tasting, Taylor and her colleagues had hit on a formula for a successful history-centered program. I immediately bookmarked it. 1. As children and their caregivers entered the program room, they took seats facing the wall where I would project images. I engaged the attendees in some chit-chat about potato chips while waiting for everyone to arrive. 2. I told the story of George Crum and the invention of the potato chip. I love non-fiction storytelling, and I drew information from a few sources for my telling of the potato chip's creation. 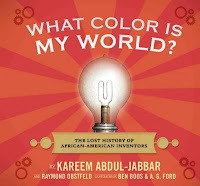 My four sources were the picture book George Crum and the Saratoga Chip by Gaylia Taylor; Kareem Abdul-Jabbar's great non-fiction title What Color is My World? 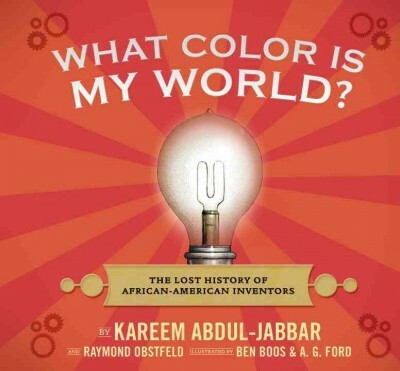 The Lost History of African-American Inventors; the Wonderopolis page on "Who Invented Potato Chips? "; and the entry on Crum in our Biography in Context database. 3. I showed a video of how potato chips are made in a potato chip factory. I narrated the steps of the process during this video, which has no voiceover. 4. We had our potato chip tasting. Six different types of chips were available in bowls around the room. 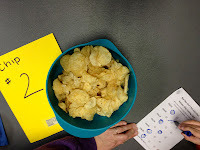 Each chip type was assigned a number, and the names of the chips were not visible; I did, however, make the ingredients available by the chips in case of food allergies. Each child picked up a coffee filter to serve as a plate, a tasting ballot, and a marker. Because I wanted the program to work for a wide age range of children, the ballot operated on a smily face system; if a child liked Chip #1, for instance, he or she could circle the smiling face. If a child did not like Chip #4, he or she could circle the frowning face. The symbol system was easy for the kids to understand. After everyone had tasted all of the chips, I handed out juice boxes to cleanse our palates. 5. While the tasters were letting their palates get back to neutral between rounds of tasting, I projected a short slideshow onto the program room wall. The slides highlighted the history of the potato chip, from information on Crum and the snack's invention up to its mass marketing and the huge consumption of chips by Americans. 6. Children got to go around and taste each chip again, this time with a mind toward choosing their favorite. 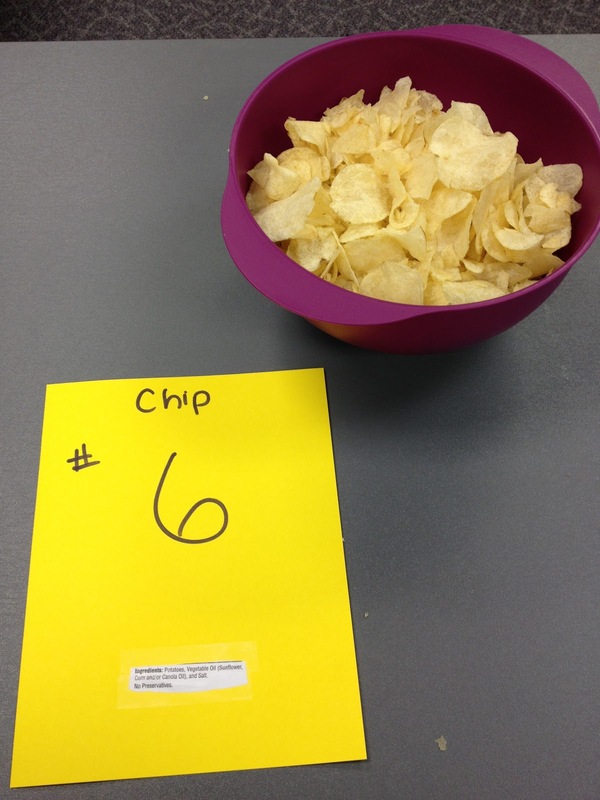 Each child and adult in the tasting told me what number chip was their favorite, and I tallied the votes. 7. While announcing our winners of the potato chip tasting, I also announced what the different chips were. Our overall favorite was Ruffles, followed closely by Lays Classic. The remaining four flavors--sea salt and vinegar, Maui onion, cracked pepper and sea salt, and parmesan garlic--all tied for third place. 8. Children then chowed down on their favorite chips while we all talked about what we've been reading lately. I love these informal moments at the end of programs to chat about books! My source material all checked out after the program, too. I would definitely classify this program as a success, something that I'll look at revisiting every few years. The kids were all very interested in hearing the history of one of their favorite snack foods, and they thrived on being asked for their opinions on what chips tasted good. 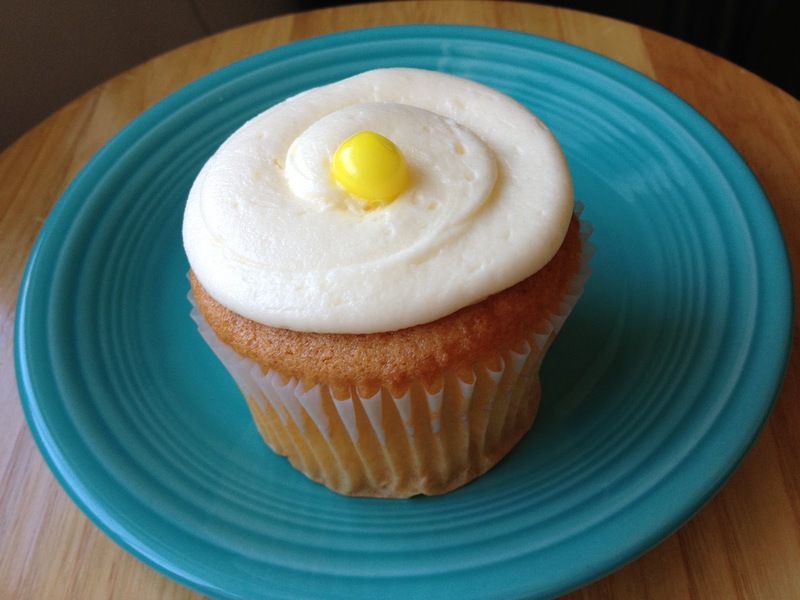 Any day a fourth grader engages me in a conversation about the mouthfeel of a food is sure to be a good day. How did you celebrate Black History Month in programs at your library? The Week and The New Yorker--what planet was I on when I decided this would be a good year to start subscribing to The New Yorker?!? I could provide you with examples of some of the things I eat and/or drink while I'm reading: fruit, cheese and crackers, some sort of sweet thing (currently Marshmallow Peeps); water, diet soda, hot or iced tea. I could also direct you to this graphic representation of what I read in an average year--although I won't be publicly sharing that same breakdown of my reading for 2013 because of my committee work. All of those snapshots provide you with a view of my reading life. What does your reading life look like? This post is part of the World Read Aloud Day Blogging Challenge, which features weekly blog prompts leading up to World Read Aloud Day on March 6. Make sure to come back next week for the details on the implementation of my library's WRAD program!